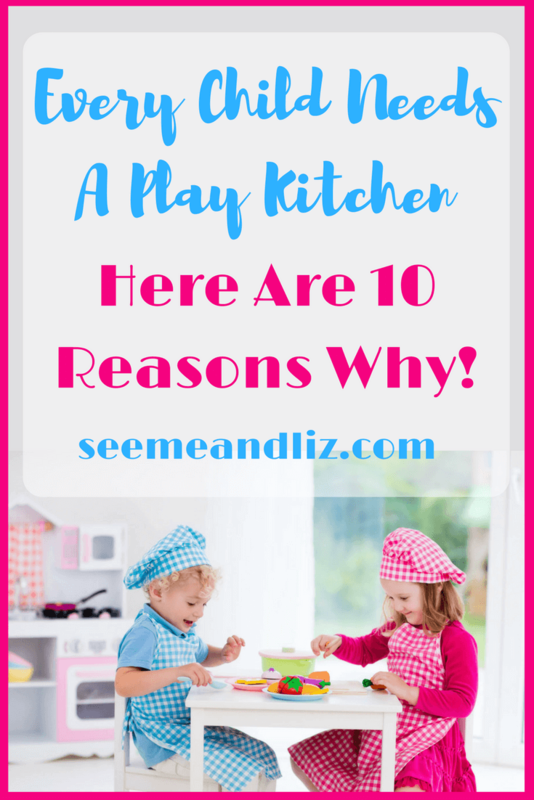 Seeme & Liz > Learning Toys (2-4 year olds) > Kids Toy Kitchens: 10 Reasons Why Every Child Should Have One! Kid toy kitchens are amazing for so many reasons. In fact, there are 10 reasons that sets this toy apart from the rest that I want all parents and educators to know about! If you already have a toy kitchen but your kids seem to have forgotten about it, then this article may help you help your child(ren) rediscover it. The 5 Best Kids Play Kitchens: They Will All Encourage Language and Learning! 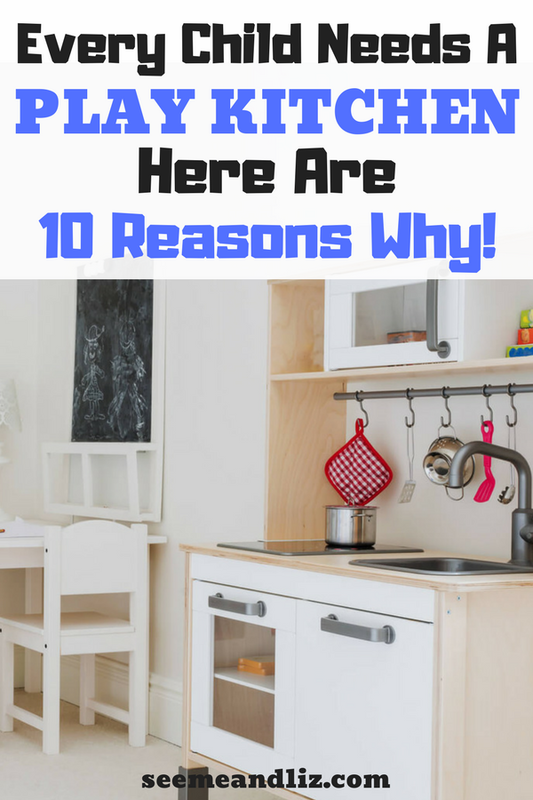 10 Reasons Why Play Kitchens Are A Must Have For Learning & Skill Building! There are actually more than 10 reasons to get a kitchen for your child. But, these are the most important ones. We purchased a kitchen for our daughter for her 2nd birthday. She is now 11 and says it is still one of her favorite toys. I tried to convince her that this year was the year to pass it down to a younger child. She didn’t like this idea at all and insisted we keep it for at least another year. The kids tend to go through phases of playing with it and then ignoring it. But they always come back to it. It is also interesting to watch how the play changes as your child gets older. The play scenarios become more elaborate and the kitchen is used for so many other things. It’s great seeing a child’s imagination soar! You don’t need a large house with a dedicated playroom to have a kids kitchen. You can even get “starter kitchens” for toddlers. These are mini versions of the larger ones. While these small kitchens are great while your child is young, it probably will be outgrown pretty quickly. I would recommend starting out with a standard size kitchen so that your child will have it for many years. The Little Tikes Cook n’ Grow kitchen is the perfect blend of a starter kitchen and a more standard toy kitchen. If you have a very small space take a look at some of the kitchens meant to go into the corner of a room. This should probably be the number one reason to get a pretend kitchen for your child. The imagination and creativity that they can inspire during play is endless. It really is the perfect toy for open ended child led play! My children have transformed their’s into a rocket ship, a school, a cupcake shop and a puppet theater. They have also placed chairs around it and covered everything with blankets so that they could have a kitchen in their fort. Children can play house, restaurant and anything else they can dream up. I always incorporated a play kitchen into my speech therapy sessions with children whose goal was to increase their vocabulary. Nouns such as – plate, cup, fork, knife, apple, bread, chicken, etc. Verbs such as – cut, pour, wash, dry, stir, bake, freeze, etc. Opposites such as – hot/cold, wet/dry, big/little, full/empty, etc. Or if your child is older and is using the kitchen as part of a restaurant scenario they can talk about restaurant vocabulary as well. For example: waiter/waitress, chef, menu, customers, etc. When several children are playing at a kitchen together they need to work on turn taking skills because not everyone can do the same thing at the same time. If the children are older they will need to work together to determine who will play what role in the scenario. Children need to combine their efforts to come up with new and interesting ways to use the kitchen. Children can practice their fine motor skills by picking up small pieces of food (most kitchens come with accessories including food, utensils and dishes, but you can buy accessory packs separately as well) and then placing them onto plates or in cups. Many kitchens have knobs that can be turned which means a child needs to use fine motor skills in order to do this. Some of the food accessories you can purchase are actually meant for children to practice their cutting skills. For example, a cucumber is cut in half and attached together by pieces of velcro. Your child can use a plastic knife (this comes with many of the sets) in order to cut the food in half. 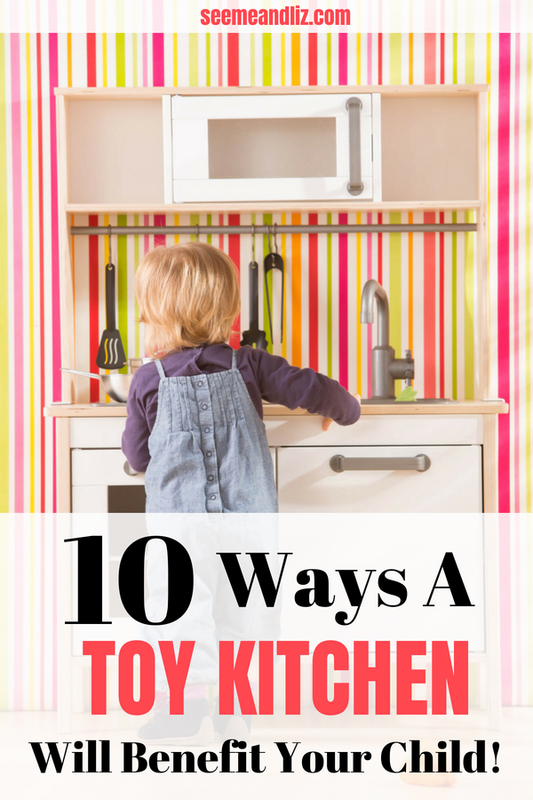 There are a variety of problems that can arise when your child is playing at a toy kitchen. For example, not all the dishes will fit in the cupboard, so your child will need to figure out other storage solutions. Or, your child wants to serve pizza in his restaurant but there is no food to represent pizza. What could be used as the pizza? If several children are playing together there is a greater chance that more problems will happen. They will need to work together to figure these out. Talk to your child about different food groups and non food groups. Sort the items in your kitchen. For example, all of the cutlery can go into one basket, the dishes can go into a cupboard. All of the fruits can go into the red bag and the vegetables can go into the green bag. Or try sorting food by color! The ability to categorize and organize is an executive function skill that all children need to have in order to expand their vocabularies and organize their thoughts to form logical sentences and make decisions. I could write a lot about the importance of categorization and how pretend play helps with this skill, but I think I will save that for another article. If your child is older, encourage her to write out a menu for the restaurant. Or next time you are at a restaurant, ask for an extra copy of the kids menu (they are usually paper) and then photocopy it. Your kids can use this as the menu for their restaurant. The child that is being the waiter can write down the guests orders. The menu can be used if your child is unsure of the spelling of certain items. Kids kitchens are great for working on counting and colors through play. I am a strong advocate against pushing early academic skills on to our kids. However, I do believe that skills such as counting (math), color recognition and literacy are important for all children to learn. It is the way you go about introducing these skills to your child that is crucial. While your child is at the play kitchen, you can join in on the play. Wash some dishes, make some food and then start counting all the plates. See if your child is interested. If the answer is yes, have him count with you. Or if he is already getting the hang of counting see if there are any items he would like to count on his own. You can also work on colors in the same way. Talk about the red pepper, the red tomato, the yellow banana and the yellow plate for example. Before you head out in search of the perfect toy kitchen for your child make sure to take a look at 5 of the best kids play kitchens that I have found that will fit everybody’s need (space, budget, gender, etc.). I have also included a bonus speech and language development section at the end of the article! Is This Not The Best Toy For Children? As you can see there are many reasons why kids toy kitchens are great for learning through play! Does your child have a pretend play kitchen? Please share some ways that the kitchen encourages his/her imagination and pretend play. What a creative toy a mini kitchen is! I never thought of buying one for my son, but definitely see the good in having one of these at home. Everything from categorizing, to colour co-ordination and even menu planning! Who would have thought a kitchen could give so many hours of fun? It really is a wonderful toy Stella, even for boys! If your son loves the idea of being a car mechanic I bet he would love one of these! 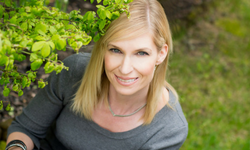 Thank you very much for this excellent article, Tanya! I love your blog too! I love hearing that your son had (and loved) a play kitchen Nathalie! There is absolutely no reason why a boy should not have this amazing toy. Unfortunately many parents are still leery of letting their boys play with a toy kitchen because they are typically marketed to girls. This is so frustrating as there are a lot of men who love to cook and probably just as many women who hate it! What a wonderful post. My daughter has had the same play kitchen for a while now, and she was so focused and preoccupied when playing with it. When she had friends over it was a joy to see the little ones playing together. They were sorting the vegetables by color or size and the fruits with the same criteria. I have to admit that it’s an excellent way of developing skills for kids. It’s so much more natural than worksheets and flashcards. Another toy which she enjoyed was her doll house; it’s still in her room even though she is 10. That’s great Dany! It sounds like your daughter got a lot of use out of her play kitchen. Doll houses are wonderful for learning through play as well! In all honesty I never thought that such a toy could have so many benefits and children could relate to them so much. Usually the toys we get our kids don’t keep their attention for long. 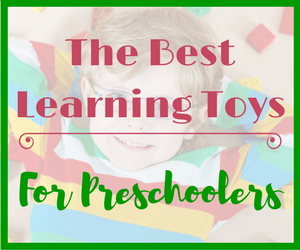 I have been looking for toys that will be played with for longer periods of time and that we can keep for a few years before they outgrow them. I will give serious thought about getting a toy kitchen for my kids. If they can actually learn while playing and not get bored with it right away it will be a great investment. Thank you for the information. You’re welcome Stratos! I’m happy I was able to show you how a play kitchen is packed with learning opportunities and hours of fun and pretend play for the kids. I found your article very interesting, I never realized that there are so many benefits for children in a toy kitchen. It is definitely great to see children learning with more traditional toys instead of being connected on mobile devices for the whole day. My child is still a baby so we don’t have many toys right now, but I will for sure consider getting a play kitchen in the future! Many parents don’t realize the learning potential in some of the simplest toys! When a child is young it is best for learning to occur as naturally as possible. A toy kitchen makes that easy and is perfect for both boys and girls. 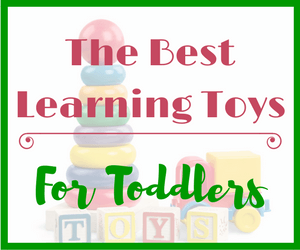 If you are interested in learning about some wonderful baby toys, check out this article! You wrote that play kitchens are great for kids to practice their categorizing skills. 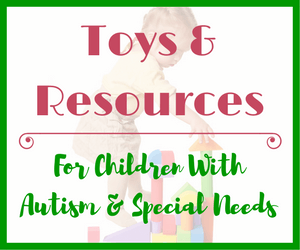 I’ve been looking for toys that my kids could play with, that would also help them develop new skills. Having skills like you mentioned could actually be really helpful later in their lives. I really like the idea of a kids play kitchen because I didn’t realize how much children can learn by playing with one. I will have to look into getting one for the kids room. Thanks for your comment. This is exactly why I will always recommend a play kitchen as the #1 toy for toddlers, preschoolers and even children in Kindergarten to grade 3/4. I always find it disturbing to see children these days getting hooked on mobile devices and Television. So young and they’re already bombarded with this unhealthy form of entertainment. But thats my point of view. Those things can be handy to distract kids when the mom is busy cooking or something else. However, I never imagined it possible that a kids toy kitchen might be a great idea. I was finding it unbelievable that perhaps this could be a good way to get children more hands on than play with these mobile devices. 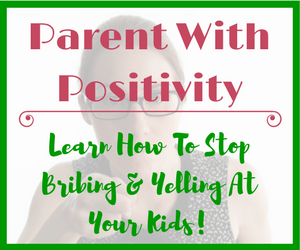 It’s great to read a post like this that can open parents to better ways to keep their child entertained as well as get constructively involved like the good old ways. I completely agree with you. Kids are being exposed to electronics at younger and younger ages. 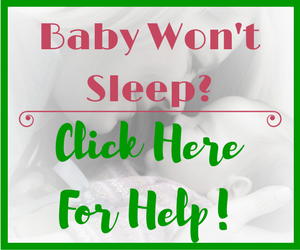 There are numerous studies that are finding children as young as 6 months own actually have been given their own tablet and use it for multiple hours a day. This really scares me. And then there is the push for early academics. Common core standards in the US require that kindergarten students have a good grasp on reading prior to entering grade one. Preschools are being set up to prepare children for kindergarten. This is so sad. Children need to learn through play and by interacting with others. They have plenty of time to use electronics and learn how to read. They need the foundation skills and those are obtained through play. A kids toy kitchen is one of the best toys to build these foundations for future success! We also have a play kitchen we also have a play kitchen and my two-year-old to my eight-year-old all enjoy playing with it together. Like you said it is a toy that will last for many ages and stages of childhood. I would say this is one of my child’s favorite play toys. What pretend food do you recommend or use in your home? Thanks Shannon! I am so happy to hear that your children all love their toy kitchen and that they play with it together. The amount of learning that goes on is so much more valuable than sitting at a table with young children working on rote counting and colors. Personally I love the Melissa and Doug pretend food. There are many different packs to choose from and they are all pretty realistic. My kids have the pizza set, the sushi set, the cupcake set and one of the cutting sets. They have had these for years and still play with them. Also, many of their sets are made of wood which is nice. And the prices are pretty reasonable for the quality you are getting.